The 23rd Annual Keystone Classic lived up to its reputation of being one of the most anticipated yearly events for Division I Wrestling Nov. 18, and Drexel University’s men’s wrestling team once again showed why they’ve historically been among Keystone’s best performing teams. The Dragons, instead of making a typical cross country trek in order to compete, visited the neighboring University of Pennsylvania, whose historic Palestra arena hosted Keystone’s 10 competing teams. Drexel’s rivals included the hosts from Penn, along with Appalachian State University, Duke University, Franklin & Marshall College, Rider University, Sacred Heart University, Virginia Military Institute, Harvard University and 2017 National Collegiate Athletics Association Division I champions, Pennsylvania State University. Drexel freshman Antonio Mininno was expected to make waves in the 125-pound division following his razor thin decision loss to Nebraska’s Zeke Moisey, currently ranked No. 5 in the 125-pound weight class in the country at the Northeast Duals. The first-year student had an exceptional showing, earning a victory in the first round against Sacred Heart’s Ryan Burns. Following a dropped decision to Appalachian State’s De’Andre Swinson-Barr, Mininno would go on to matchups against Appalachian State’s Andy Richard, Penn State’s Justin Lopez, and VMI’s Clifton Conway to take third place overall. Drexel’s efforts at 125 pounds were not at an end however, as the Dragons decided to put Mininno’s brother Dante, also a freshman, on the mat. Mininno began the day with a gritty pin victory over VMI’s Clifton Conway. He then suffered a pin loss to Penn prospect Carmen Ferrante, followed by a decision loss to Penn State’s Devin Schnupp, which ended the freshman’s hopes of placing high. Drexel walked into their matches at 133 pounds with some uncertainty, having lost their starter and 2017 Keystone Classic champion Austin Desanto. The Dragons’ nerves proved to be unfounded as sophomore Chandler Olson, despite losing in the finals match to Penn State freshman phenom and undefeated high schooler Roman Bravo-Young, earlier decisioned VMI’s Hunter Starner and Penn State’s Scott Stossel, which was enough to earn him second place. The 141-pound division proved to be the toughest of the lower weight classes for Drexel to secure results in. Sophomore Julian Flores dropped his first matchup against Appalachian State’s Anthony Brito, though he managed to stay alive in his consolation bracket after being granted a forfeit win against Franklin & Marshall’s Brett Kulp. Flores’s run ended following a close bout with Penn State sophomore Dom Giannangeli. Drexel junior Nick Widmann would also fall at the hands of Giannangeli at 141 pounds, losing out in a 5-3 decision. Widmann proceeded to the consolation round, but crashed out after being pinned by Sacred Heart’s Gerard Daly. At 149 pounds, Drexel sophomore Trevor Elfvin’s run had its highs and lows. The underclassman picked up a 10-8 decision over Harvard’s Zeth Dean and pinned VMI’s Zach Schmitt in 1:10, before being defeated by Penn’s Anthony Artanola. Elfvin mounted a small comeback in the loser’s bracket with a pin of Franklin & Marshall’s Cole Aaron. Appalachian State’s Jonathan Milner met Elfvin in the semi-final, out-grappling the Drexel representative to a 13-3 win. Redshirt sophomore Vincent Foggia had his first match in the 149-pound division with Penn State’s Jarod Verkleeren, whose team had gradually been handing Drexel most of its losses on the day. Foggia was forced into the consolation rounds after being handed a 12-4 decision loss by Verkleeren. Foggia put up a valiant fight in his contest against Franklin & Marshall’s Cole Aaron, but it turned out to be his last match as he left the mats with a 6-5 loss. 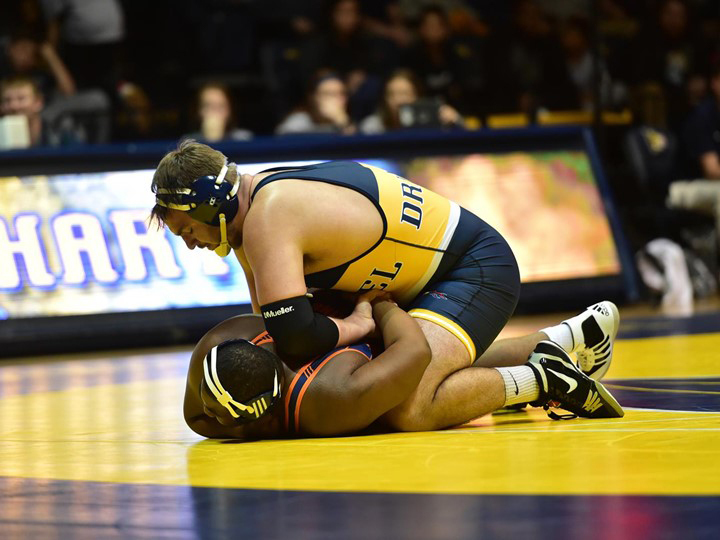 Drexel began to turn their fortunes around as the middle weights began competing, with sophomore Evan Barczak leading the charge. Barczak made his way to the 157-pound finals after pinning Penn’s Willy Kaiser and earning decisions over Appalachian State’s Angel Najar and Harvard’s Hunter Ladnier. Penn State proved to be Drexel’s greatest hurdle once more as Barczak fell to three time NCAA finalist Jason Nolf. Nolf secured a pin of Barczak at 4:46, leaving Barczak with the second runner-up spot. Another Dragon in the 157-pound bracket was sophomore Felix Belga who lost back-to-back decisions against Appalachian State’s Matt Zovistoski and Penn’s Jon Errico, earning no points in either match. More top placements were secured for Drexel in the 174- and 165-pound divisions by redshirt freshman Bryan McLaughlin and junior Ebed Jarrell, respectively. McLaughlin moved passed the Round of 16 after defeating Appalachian State’s Thomas Filtz, but VMI’s Neal Richards pushed McLaughlin into the loser’s column after the quarter-final round. McLaughlin earned three decisions in a row to reach the third place match where he once again fell to Richards, with both match scores being nearly identical. Jarrell eliminated VMI’s Jakob Kennedy, Franklin & Marshall’s Crew Fullerton and Rider’s Jesse Dellavecchia on the way to the 165-pound final. Despite a great showing of heart, the upperclassman had to settle for a second-place finish following a technical fall defeat to Vincenzo Joseph of Penn State. Drexel closed out its day with success, brought on by the heavyweights. Senior Stephen Loiseau decisioned each of his opponents until his loss to Penn State’s Bo Nickal in the 195-pound finals, and redshirt senior Joey Goodhart saw his story play out similarly in the 285-pound division. Goodhart arrived to the finals with ease, before finding himself being outpointed by Penn State’s Anthony Cassar. Five runner ups, one third-place and one fourth-place finish led to a second-place final standing for Drexel among the 10 teams dueling for greatness at the Keystone Classic. The winner, Penn State, has been listed near the top of the elite wrestling programs in the country for almost a decade. Drexel will travel to Las Vegas for the Cliff Keen Invitational Nov. 30, where they will hopefully be able to keep announcing themselves as a force to be reckoned with.